With my book Water is for Fighting Over: and Other Myths about Water in the West officially releasing Thursday, this week I’m visiting here some of the issues, themes, and back stories. Mostly I’m doing this for fun, but I would also be delighted if you would click here and buy a copy or two for yourself and the water managers in your world. One of the most important characters in the book is the late Elinor Ostrom, a political science who in 2009 won the Sveriges Riksbank Prize in Economic Sciences in Memory of Alfred Nobel, more commonly called “the Nobel Prize in economics”. In the book, I make fun of the fact that when the award was announced, a number of prominent economists allowed as how they’d never heard of her. But to be truthful, I never had either. I was working at the newspaper at the time, and had been spending the previous few years trying to better understand economics, to fill a hole in my intellectual tool kit. I’d taken a couple of courses in the UNM economics department and fancied myself an econ nerd. So when the prize was announced, I killed a couple of hours in the afternoon reading the Nobel committee’s lay audience summary of Ostrom’s work (pdf). It was a head smacking day for me. Toiling outside the mainstream of economics, Ostrom and her colleagues, including a remarkable generation of grad students had been looking, empirically and in great volume, at case studies of how people actually manage common pool resources. The conventional view, so powerfully captured by Garrett Hardin’s 1968 essay The Tragedy of the Commons, is that we will overuse such resources – an open pasture, or an unregulated aquifer – unless it is either turned into a private property regime or regulated by an outside governmental authority. 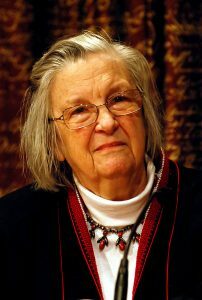 As a political scientist Elinor Ostrom’s research methods differed from how most economists work. Usually they start with a hypothesis, an assumption of reality, which is then put to the test. Elinor Ostrom started with an actual reality instead. She gathered information through field studies and then analyzed this material. In her book ‘Governing the Commons’ from 1990, she demonstrated how common property can be successfully managed by user associations and that economic analysis can shed light on most forms of social organization. Insofar as one accepts the Hardin framework in water management, turning it into a private commodity is difficult on many fronts. So we’re left with the heavy hand of government. And that is what I had come to expect the solutions to the West’s water problems would look like – a mandate from the “state” or the “federal government” to ration the scarce supplies remaining. And here came Ostrom blowing into my life like a refreshing breeze off of Santa Monica Bay. There is a third path, Ostrom found. It’s a messy, fuzzy process in which users come together and craft their own institutions, their own rules. Often, it works! I bought her book Governing the Commons, and the direction of my work shifted. I began to look not for opportunities for regulatory intervention, but rather for the ways in which users of a common pool resource come together to regulate themselves. When I dove into work on the book in earnest the following year, in 2010, the questions suggested by Ostrom’s ideas were everywhere. They completely reframed my thinking about how to approach water problems. It completely framed everything I did from that point forward. Traditional histories of California water generally treat what happened in the West Basin and the adjoining groundwater basins with a wave of the hand, as if what the communities did was straightfor- ward—they were over-pumping, so they all got together and came up with a plan to pump less groundwater and bring in Colorado River water to replace it. Ostrom’s genius was in not taking that for granted, in realizing that the central question was how they came together to do that. Questions that to others seemed trivial to Ostrom were not. What she showed is that creating institutions capable of collectively managing the West Basin’s groundwater was not as simple as slapping down a new government agency and then flipping a switch to turn it on. As I toy with ideas for my next book, the idea of an Elinor Ostrom biography is there. But I think I will probably not try it. I know my limitations, and I know I don’t have the writerly chops or the depth of understanding of her ideas to do her justice. She deserves a great biography. Just a reminder that one of her final graduate students is a prof at UNM. I know that they have stories of her final days/years at IU. There are plenty of clips, accounts, and reachback to the experiences that people had with her. It would be a shame to wait too long and have them lost.